Orange marmalade is a very classic way to use oranges. It boasts a sweet, tangy flavor that perfectly accompanies toast. I find homemade jams and preserves charming. They have a unique quality that cannot be simply purchased. As strange as it may sound, the effort put into handmade goods can be tasted. This jam takes a good amount of time to reduce, but it is well worth the time. Letting it reduce slowly will allow the flavors to develop and keep the sweet jam from burning. As long as the heat is low, the jam does not have to be watched or stirred constantly. Not only is orange marmalade delicious, it is simple to make, and does not require many ingredients. 1. Use a vegetable peel to remove the zest of the orange. Chop roughly so that there are no huge pieces. Place into a container with water to soak for 2 hours. This softens the peel and allows the water to penetrate it. 2. While it softens, cut off the peel (pith) of the orange with a chef knife. Cut the ends off the orange and then cut right where the meat of the orange meets the pith. 3. Cut out the segments, avoid the membrane (skin) that holds the orange segment, but cut as closely as possible while keeping the segment intact. 4. Save the leftover part of the orange, as it will be used for the marmalade. 5. Place the peel into a pot with water to immerse the peel. Add salt. 6. Boil on medium-high until the peel is tender. If you poke it with a fork, it should easily penetrate the surface. This will take about 30 minutes. 8. Combine remaining ingredients in the pot, along with the peel. 9. Simmer on low heat until it begins to thicken. Stir occasionally. 10. Turn off the heat when the mixture is dark, clear, and thick. The color will be amber, and the bubbles will slow as the water evaporates. 11. Allow to cool slightly before placing to store. I love to use the orange marmalade in tea to add sweetness and flavor. You can add it to a tea, or just mix it into hot water to create a orange "tea". I, personally, really like sweet teas, and the orange adds a beautiful acidity to brighten up any tea. The vitamin C that the orange provides is also a great way to soothe a sore throat and overcome a cold. I am so grateful for everyone who has been supporting this blog. Help me to continue to grow as a blogger by spreading the word and visiting the page often! 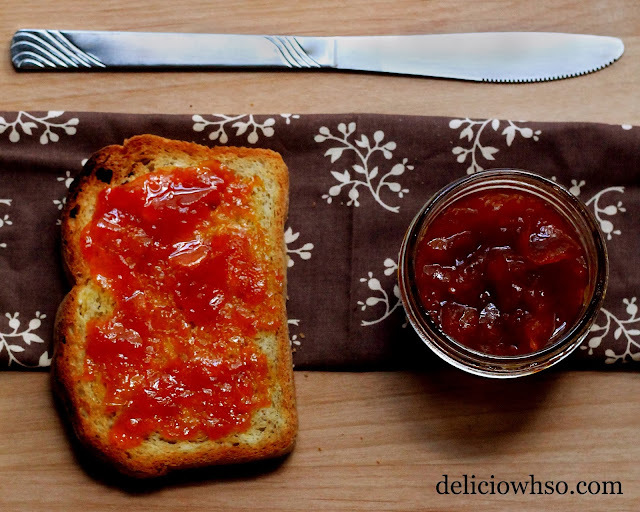 Orange Marmalade is used to eat with bread and people will like the taste. i hope about this essay service uk of creating some blogs. These blogs are special and people will like t. I hope to understand this work.